Tutoring for twittering teens and prude prom queens now comes in an accessible format. The USB-driven finger DDR teaches those flirtatious fingers some moves outside of the T9 temptation. 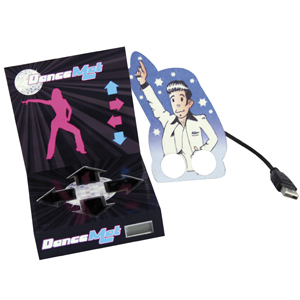 As if you didn't feel dirty enough by sliding two fingers into a cardboard cut-out, the finger DDR then prompts you to move them around. Admittedly though, the flashing lights may be more direction than you could ever weasel out of your ex-girlfriend, so take notes.